Lamp black is a very opaque, heavily staining black pigment that does not have much covering or tinting power. It is typically the most opaque black in watercolor form. Though a very pure black, it tends to muddy slightly in mixtures. Natural sources may be brownish or bluish in tone because of impurities. 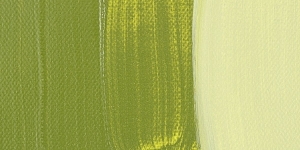 When used in oil paints, it is one of the slowest drying pigments, and should not be used in underpainting or applied in layers underneath other colors. Lamp Black is very lightfast and absolutely permanent. It is used in all techniques in permanent painting. Carbon itself is not considered hazardous, however other combustion products that are hazardous are often present as impurities when Lamp Black is produced from natural materials. For this reason, commercial preparations of the pigment should be considered slightly toxic. Avoid skin contact and inhalation. Where such impurities are present, Lamp Black is a possible human carcinogen. Lamp Black is a carbon based black traditionally produced by collecting soot (known as lampblack) from oil lamps. It has been used as a pigment since prehistoric times. It is the black found in Egyptian murals and tomb decorations and was the most popular black for fresco painting until the development of Mars Black. Carbon Black, Channel Black, Furnace Black, Oil Black, Vegetable Black. Flame Black is an impure version of Lamp Black. An alternate spelling is Lampblack, in which the first syllable is stressed and the two words are elided to form a closed compound. Nickel Azo Yellow is a transparent greenish yellow pigment with average drying time. Nickel Azo Yellow has excellent lightfastness. Nickel is considered toxic and may irritate skin. Do not breathe the dust of this pigment. Green Gold, Nickel Complex Azo.